Background: In Ethiopia, malaria, anaemia and undernutrition are common childhood health problems. The country is planning to reduce these conditions to a level where they are not a public health problem. Meanwhile, for the success of this aim, a description of the occurrence and interaction of malaria, anaemia and undernutrition could help contribute to design tailored, efficient and effective control strategies. This study was done in the context of malaria prevention trial, which aimed to measure the effect of combining long-lasting insecticidal nets (LLINs) and indoor residual spraying (IRS) in reducing the malaria incidence compared to LLINs or IRS alone. The study area was affected by a serious drought and famine during the first year of the study. 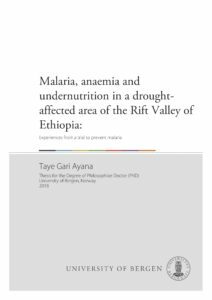 Objectives: The overall aim of this thesis is to improve our understanding of the effect of malaria prevention on anaemia, and to assess the association between malaria, anaemia and undernutrition among children in a drought-affected area in south-central, Ethiopia. Methods: A cohort of 5309 residents was followed-up for 16 weeks to measure the variations in malaria incidence among villages (Paper I), and the results were used as a baseline to calculate the sample size needed for the trial. We followed a cohort of children aged 6 to 59 months for one year to describe anaemia and changes in haemoglobin (Hb) concentration (Paper II). A cohort of 4468 children was followed-up for 89 weeks to measure the relationship between malaria and undernutrition (Paper III). Weekly home visits and patient self-referral were also used to identify malaria cases. We conducted Hb concentration (once a year) and anthropometry (twice a year) surveys. Results: In Paper I, we observed a variation in malaria incidence among villages. On the other hand, the insecticide-treated nets ownership was low (27%), with the distance from the lake or river and younger age being the main risk factors for malaria. The findings of this study were used as a baseline to calculate the sample size for the trial. In Paper II, despite the malaria prevention effort in the community, we observed an unexpected increase in anaemia prevalence over the period of a year, which could be due to the drought and famine that affected the area. A higher incidence of anaemia was observed among children with stunting, malaria infection, young age and in poor families. However, no significant difference in anaemia prevalence was observed among the different trial arms (LLIN+IRS, LLINs alone, IRS alone and routine arm). In Paper III, malaria infection was a risk factor for stunting and wasting, although undernutrition was not a risk for malaria infection. Furthermore, an increase in the prevalence of stunting, but no significant change in a prevalence of wasting was observed over time. Conclusions: We showed a large variation in malaria incidence among villages. Conducting trials in a drought-prone area may bring an unexpected challenge. We observed an unexpected increase in anaemia prevalence over a year. There was no significant difference in anaemia prevalence among the trial arms. Moreover, a close follow-up of the nutritional status of children with malaria infection may be needed. There could hence be a need to prioritize villages nearer to the main mosquito breeding sites for malaria control. Gari T, Loha E, Deressa W, Solomon T, Lindtjorn B. Malaria is associated with an increased risk of stunting and wasting among young children in Ethiopia: Results of a cohort study. 2017. Submitted publication. Introduction As part of a field trial (PACTR201411000882128) to provide evidence on the combined use of long-lasting insecticidal nets and indoor residual spray for malaria prevention, we measured haemoglobin values among children aged 6 to 59 months. The aim of this study was to estimate the prevalence of anaemia, and to determine the risk factors of anaemia and change in haemoglobin value in Adami Tullu district in south-central Ethiopia. Methods Repeated cross-sectional surveys among 2984 children in 2014 and 3128 children in 2015; and a cohort study (malaria as exposure and anaemia as outcome variable) were conducted. The study area faced severe drought and food shortages in 2015. Anaemia was diagnosed using HemoCue Hb 301, and children with haemoglobin <11 g/dl were classified as anaemic. Multilevel and Cox regression models were applied to assess predictors of anaemia. Results The prevalence of anaemia was 28.2% [95% Confidence Interval (CI), 26.6–29.8] in 2014 and increased to 36.8% (95% CI, 35.1–38.5) in 2015 (P<0.001). The incidence of anaemia was 30; (95% CI, 28–32) cases per 100 children years of observation. The risk of anaemia was high (adjusted Hazard Ratio = 10) among children with malaria. Children from poor families [Adjusted Odds Ratio (AOR); 1.3; 95% CI, 1.1–1.6)], stunted children (AOR 1.5; 95% CI; 1.2–1.8), and children aged less than 36 months (AOR; 2.0; 95% CI, 1.6–2.4) were at risk of anaemia compared to their counterparts. There was no significant difference in risk of anaemia among the trial arms. Conclusions Young age, stunting, malaria and poverty were the main predictors of anaemia. An increase in the prevalence of anaemia was observed over a year, despite malaria prevention effort, which could be related to the drought and food shortage. Therefore, conducting trials in settings prone to drought and famine may bring unexpected challenges.